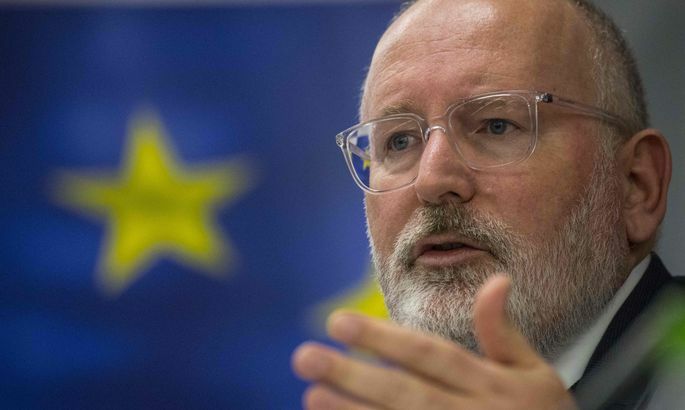 Just like President of the European Commission Jean-Claude Juncker, who found himself on propaganda posters in Hungary, his Dutch right hand man, First Vice President Frans Timmermans, has also been treated to personal attacks as payback from a member state called to order. “You simply need to ignore them,” Timmermans recommends. You have been dealing with several EU countries that have been deviating from rule of law and the good practice of democracy. Why is this happening? Do you think it is exceptional? It is exceptional, because a number of things are now coming together. What is not exceptional is that EU rules have been regularly challenged and criticized by member states. I have seen it before, especially after enlargement. First, you get a relatively long period of satisfaction and happiness. We’re part of the club now. Then, after 10-15 years, new member states that aren’t new anymore start to question whether it’s all really in their interests and start seeking a bigger role. And that is when they become very difficult. To some extent it is logical that now we have some tensions with Central and Eastern European member states. But there is also a bigger picture. The crises we’ve had – economic, financial, migration, terrorism crises – combined with the world changing at breakneck speed, make a lot of people insecure, and then some politicians use nationalism as a recipe. And that nationalism is extrapolated into we make our own rules, and the rest should leave us and our rules alone. Because we have this industrial revolution that affects everyone and changes everything, every institution is called into question and should adapt. For the first time in my experience, even the institution of democracy is challenged. Democracy, which in my book is just as much about respect for the position of the minority or the opposition as it is for the majority or the will of the ruling party, is turned into if I win an election, the winner takes all, and I can decide whatever happens. In the sense that I can control the judiciary, the media, business sector. And that is a vision of democracy that is at fundamental odds with the European Union and how it should function. That is why we must stand up for democracy that respects rule of law, that respects fundamental rights, because at the end of the day, we are a continent of minorities. Even the biggest country – 83 million Germans – they are a minority in a union of 500 million. So, we need to make sure that the rights of those who do not have the majority are respected, because those who have the opposition today might have the government tomorrow. Your first example – how after coming to power, you start taking over the media and everything else – was rather reminiscent of Hungary. Hungary, but you also see it in Poland, Turkey. But the first one to do it was Putin in Russia. There was chaos, hyperinflation, robber privatization, a very strange form of democracy, and terrorism and war on top of it. And then Putin said you should elect me; I will bring stability and security, but it will come at a price, and the price is your liberty. And the Russian people bought it, because they were so desperate, insecure and scared that the deal seemed like a good deal. Viktor Orban is a very close friend of Putin’s. He has observed this, and because he lost an election in the past and didn’t want to lose another one, he thought of how to prevent that. You make sure your people are very afraid and say that I’m your protector and will keep your fears at bay, but there is a price. My fundamental point is that if you trade liberty for security, you will have neither in the long run. Liberty and security need to be sacrosanct in the EU. If liberty is threatened – whether it’s freedom of media, civil society, parties, enterprise or trade unions – I think the EU should speak up. The cases of Hungary and Poland are quite distinctly different from Russia. The former weren’t nearly as desperate. True. Nevertheless, the playbook, the idea that you can corner democracy by saying that if I win the election, I can also decide over judges and the media is something that was first experimented with in Russia. And I’m not saying the situation is comparable, because the nations, cultures and backgrounds are different, but this idea that you can chain people to their fears and convince them you are the only one that can deliver them from danger – if it works, they will give you a lot of power. You have been responsible for detangling situations where lines have clearly been crossed in the EU. How do you do it? The European Commission has a number of instruments at its disposal. Chief of these is the infringement procedure. If we feel a member state is violating their obligations, we will act, and if we cannot solve the matter in dialogue, we will turn to court at the end of the day, and the court will rule. Until now, every single member state has respected the rulings of the Court of Justice, making it a very powerful instrument. When we went all the way with Hungary, the country respected the court’s ruling and complied. Even in the case of Poland, where we have seen a single Court of Justice ruling concerning rule of law, Poland accepted it. There are still complications of course, but Poland has said they will apply the ruling. The authority of the Court of Justice is a very powerful tool and an impartial one. Then, of course, there is the Article 7 procedure, which is new and allows a debate in the Council. The Council is still learning how to have that debate and is having trouble from time to time, as it is very difficult to hold one of your member states accountable. In the EU, we are very good at criticizing countries that want to become members and we demand a lot from them. But once countries are members, we have much greater difficulty holding them accountable. The Council is learning, and we are improving. Some are saying it will take a long time, and that’s true; things in Europe often take a long time. But we are relentless, and I’m sure we will see improvement. Where does Romania stand, compared to Hungary and Poland? Romania is different, because the issue there is that they have been extremely successful at fighting corruption in the past ten years, coming from a very low base obviously. This is the one new member state where there have been very high-level convictions of corrupt politicians and businessmen. And what we are seeing now is in essence a pushback of the system to the fight against corruption. And it is our task at the European Commission to make sure this fight is continued and concluded successfully. That is why we are having an intensive dialogue with Romanian authorities to make sure they do not go back to their old ways or give up the fight. Of course, they are under immense pressure from a part of their political system – politicians, businessmen and others are saying we want to be let off the hook, we don’t want to be convicted and should be left alone. So, that is a different issue, but the same anti-European rhetoric is sometimes used in that different context. Every time there is an issue with a member state, the first thing we hear is “double standards”. Next time someone says “double standards”, I will react by saying that’s the standard reaction. Nobody likes to be criticized. But that’s the case in a soccer match: nobody likes the referee. The European Commission is like the referee without whom you can’t play soccer. The EU treaty can’t work without someone checking it. And without it, the EU can’t work. Just like soccer referees, you often find yourself – as did your boss Jean-Claude Juncker recently in Hungary – under personal attack. How do you deal with them? Is this a sign of some kind of moral disintegration of Europe? The rules of engagement on social media are quite coarse, quite brutal, and sometimes people overshoot completely with threats and really-really insulting things. You can either ignore them or engage in a positive way. And the latter can produce surprising results when people say they didn’t mean it or that they disagree. In a democracy, it’s perfectly normal to disagree. Should we take it as a good sign or bad when these guys shout and organize propaganda campaigns but don’t really want to leave the EU? They might, but their voters don’t. Since the beginning of my controversy with the present Polish government that has now lasted for over three years, people here and elsewhere have been telling me: “Don’t do it! It will anger the Poles against Europe”, “It will lead to a PolExit”, “They will see you as the new Moscow”. All these things have been said, but the truth of the matter is that Europe is more popular in Poland than it was three years ago. And if you ask in opinion polls who is to blame, the majority of Poles will say it’s the Polish government. Despite the fact it’s easy to blame the Commission. Even some of the people who voted for this government are saying it’s their fault. Do think it is possible to make normal centrist democracy popular again? Against this upsurge of populists? I think there are two elements. First of all, I believe that people who vote for extremist parties – and we just had an election in the Netherlands that once again showed this – do not necessarily share their views. They’re just angry with the system or feel disappointed and left out. If people feel let down, abandoned and vote for extremist parties, you should do something about the reasons why they feel let down. But the worst thing centrist politicians can do is to think that if I want those voters back, I have to have the same ideology as these extremists. No, if you want them back, you have to do something about the reasons why these voters believe the extremists are a better answer. For me, this is the decisive question in terms of whether our form of democracy will be stronger or weaker in the future. You can only get people back by solving their problems, not by mimicking the extremists. Your own political family – the social democrats – have lost quite a bit of ground in recent years. Yes, we lost support even in Estonia in the last election. What do you think is behind that? Several things. People are disappointed with traditional political parties and movements. It’s not just us; center-right parties have lost support as well. In most countries, even the greens have lost support, even though they are very popular in Germany and the Netherlands. The age of the big popular parties is over, I think. There is more political fragmentation almost everywhere. Also in Estonia, it is becoming more and more difficult to form coalitions. The second factor is that people are disappointed, because they come out of a crisis to see that the differences between the rich and the poor have grown. They are disappointed in us, as we are about decreasing these differences. We have a very urgent agenda, which is the social agenda. If we can produce results there, I’m sure people will come back. We had a huge low point in the Netherlands a few years ago. We were used to getting 20, 18, 23 percent at elections. In the last election, we only had 5 percent. In this week’s election, we got 9 percent – still very little, but it’s a huge difference compared to 5 percent. So, trust is slowly coming back. It’s going to be a long process, and we have to prove that we deserve that trust step by step. But I believe we can get there. I also see it in other countries, like Italy for example. They were at 14 percent some time ago, and now there’s a new leadership, there’s more clarity in terms of where we want to go, and we are above 20 percent there and second in the polls after Savini’s party. The same thing is happening in Spain. In Portugal, we are at 40 percent; it is 54 percent in Malta. It depends on the region, but you are right: support for us is more modest compared to the past. Again, it is the disappointment with inequality in society, but also because there is more political fragmentation, and because the age of two or three huge and popular parties is over. You’re the spitzenkandidat for the socialists for European Parliament elections. What are the socialists promising this time? I have been going around Europe a lot by now, and I get the same message almost everywhere. People think society today is not fair. They want us to do something about it: this is about introducing minimum wage everywhere, about having a fair fiscal system… The fact that we have companies in Europe making billions of euros in profit while not paying any taxes is so unfair that we have to do something about that. We need to have progressive taxation systems, so that people who are rich and getting richer every day would pay a fair amount of taxes and couldn’t siphon their wealth off to the Cayman Islands. We need to do something about housing. It might not be the biggest problem in Estonia, although Tallinn is also becoming expensive because of Airbnb etc. Young people are having difficulties. Everywhere I go, when I ask young people what they worry about, it’s climate change and housing. They say I’m 30 years of age and still live with my parents, because there is no way I can afford a house or apartment in my city. We should have an agreement with major cities and other areas, that if they allocate 30 percent of new construction for social housing, we will support them with structure funds. Those are the things we can do on the level of the EU. More fairness, both in terms of equal pay for men and women, in terms of minimum wage, doing something about the pension gap, protecting people in the workplace, because too many are working with zero-hour contracts and little protection. Secondly, wages need to go up in many parts of Europe. Estonia is a little different, because your salaries have gone up. In Central Europe, while the cost of living is nearing Western Europe, there is still a huge discrepancy in terms of level of salary in many of these countries. This is unjust. That is not what Europe is for. Salaries going up would benefit everyone, including on this side of Europe. So, these are some of the things we need to do in the next couple of years. You mentioned climate briefly. Young people are clearly concerned. Do you feel older people – middle-aged and older – get what the young are trying to tell them? It might take some time. But people like Greta Thunberg and others inspire me deeply. They are dissatisfied and angry, and in my book, they can’t be angry enough. I think it’s very important. The longer we wait for this change, the more expensive it is going to be and the more damage we will do to our natural environment. You can pretend that you can ignore science for a bit, but not forever. Coming back to the spitzenkandidat issue, do you see it as a way to help your fellow social democrats, or do you really believe the system is here to stay? If the next European Commission president will be a spitzenkandidat, the system is here to stay. If its opponents will succeed in destroying it this time, then the system is gone. One off is one off, but twice is a system.